Make light use of all your packing and moving of appliances. 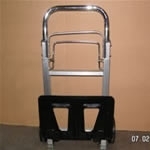 This very light easy to use box trolley, is ideal for moving your packed removal boxes for moving house. It eliminates any heavy lifting of your boxes to your vehicle from the home, and it easily folds down again in seconds for simple storage. Maximum load weight 90 kilos.